How to Transfer Contacts to iPhone Xs, iPhone Xs Max and iPhone XR? Home> Resource> iOS Transfer> Finding Ways to Transfer Contacts to iPhone Xs/Xs Max/XR? Here! Are you facing this situation - you want to buy iPhone Xs/Xs Max/XR which will be released in these days but you think it is tired to copy files to the new phone, especially the contacts? It's OK! You have no need of transferring your contacts to iPhone Xs/Xs Max/XR one by one manually from your computer or old phone. This article will show you the way to transfer contacts from computer or old phone to iPhone Xs/Xs Max/XR/X/8/7 quickly and safely. 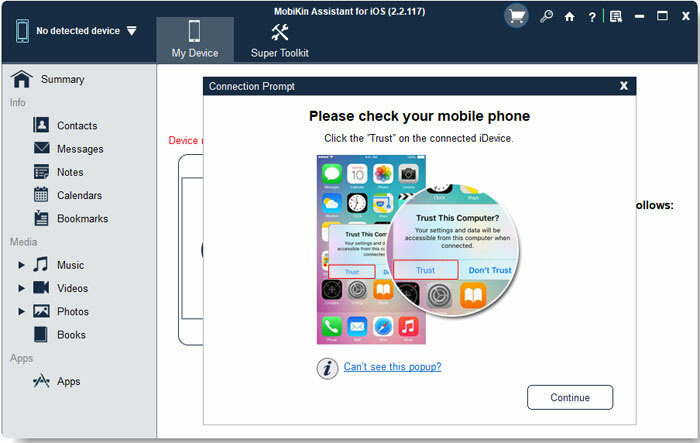 If you have ever backup the contacts on your phone to your computer in case of data lost, you can choose to transfer the contacts from it to your new device rather than type in them to your new phone by your hand. Here you may ask: how can we do that? It is easy. You just need to ask MobiKin Assistant for iOS for help, then you will achieve your goal very simply. What is that? It is a professional tool designed for iDevice users. 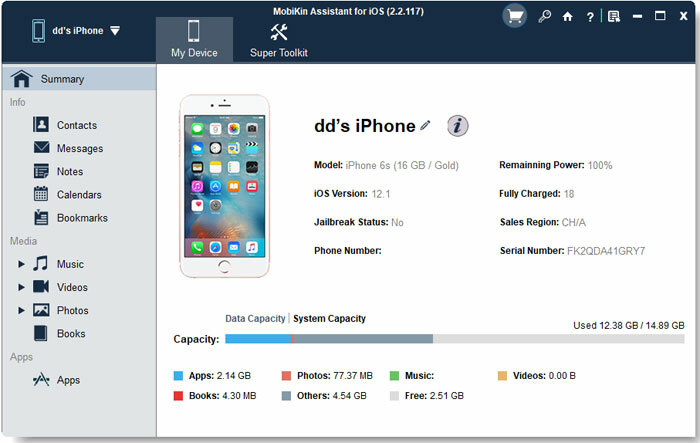 With it, you are able to backup, export, import , uninstall, preview or edit all kinds of iOS data on the desktop computer directly. Besides, there will no any quantity or quality lost during the transmission so that you can use it trustingly. In addition, it is user-friendly. You can accomplish the transfer within several simple clicks. Now let's learn how to operate the program. Notice: please download and install the latest iTunes version on your computer. 1. Connect your iPhone to computer with an USB cable, then launch the tool on your personal PC. Then, it will detect your linked iPhone and show you an interface to ask you trust the computer on your phone. Just click on "Trust" and then tap "Continue" on your computer. Then your iPhone will be recognized. 2. After the recognition, you will see various folders listed on the interface. Just click on "Contacts" option to locate and preview the whole contents of this file. 3. Then tap on "Import" button to start the transmission. 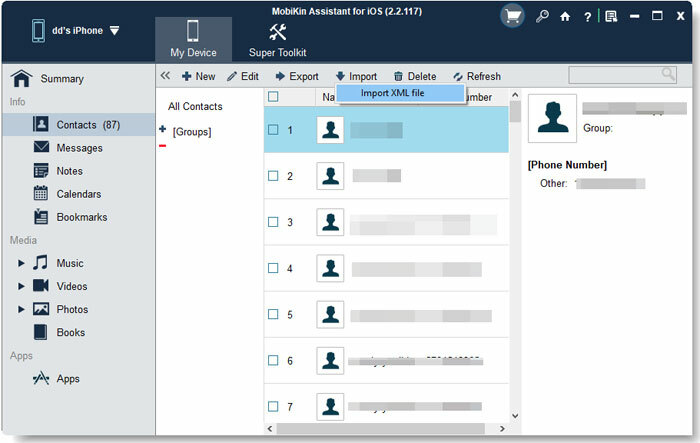 Here you should pay attention to the format of the selected contacts on your computer because only the contacts in XML format can be imported from computer to iPhone. The method we mentioned above is only applicable to transfer contacts that have backup on computer, but what if you do not backup these data before? Take it easy! 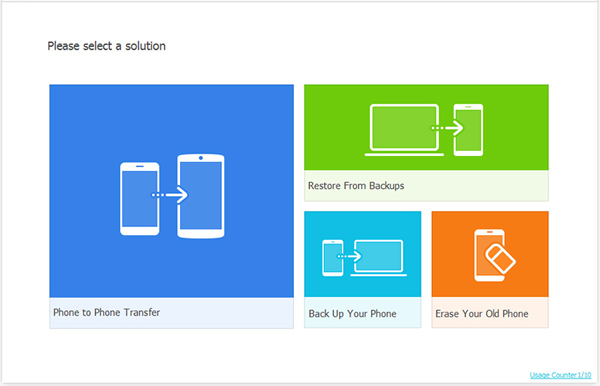 You have another choice - Phone Transfer, which enables you to copy files from phone to phone. No matter what kind of phone you have- iPhone or Android mobile phone, you are able to realize the transmission between them easily. 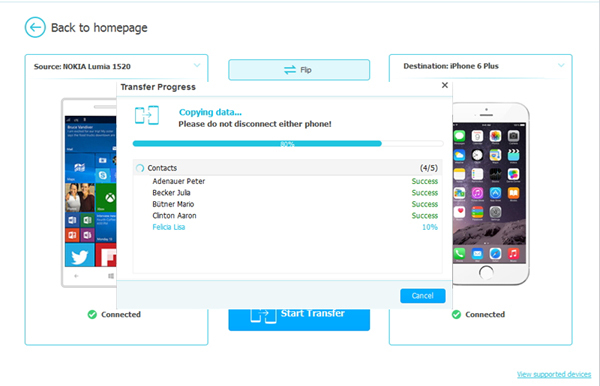 Now this phone transfer software has Windows and Mac version. The download sources are listed below. You're free to download the Windows trial version or Mac version on your computer and then begin the operation. Also, before launching the program, you should make sure that the iTunes on your computer is the latest one. 1. Double click the program on your computer after the installation to launch it. Then click the Phone to Phone Transfer mode on the interface. 2. Connect the old phone and iPhone Xs/Xs Max/XR to the computer via USB cables and let the program detect them. After that, it will set these two phones in the source and destination areas respectively. If they are in the wrong positions, you can click the Flip button to switch their order quickly. 3. Then you will see the data that you can transfer on the interface. Tick the "Contacts" folder and then hit the "Start Transfer" button to move contacts from your old iPhone or Android mobile phone.